CM Magazine: Artsy Colour Outside and Inside. Artsy Colour Outside and Inside. Connie Fisher & Gwen Smales. Huntsville, ON: The Artsy Pear Studio (www.artsypear.com), 2011. Pretty purple flowers that tickle my nose. 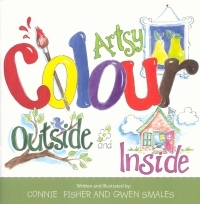 This creative book about colours includes a page of rhyming text about each of 10 colours (red, blue, yellow, orange, green, brown, pink, purple, black, and white) with a drawing on the opposite page of all of the things of that colour named in the text. The text is formed of five lines of rhyming couplets. The words referring to the coloured objects are printed in that specific colour. For example, the words in the following passage in bold are coloured pink in the text. Flamingos eat shrimp that tint their feathers pink. Standing still on one long leg is hard to do, I think. We've misplaced our pencil and pastel in this book. Although not quite as engaging as looking for a smiling mouse or puppy, or even a Waldo in a striped cap, the search for the pencil and pastel may help some of your listeners stay focused. 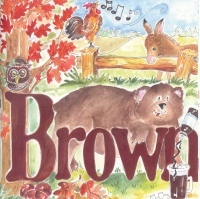 The presentation is cute and clever and worthy of consideration for a spot on your pre-school/kindergarten shelf.